You know those times when you begin to dream up a project to do… then something else comes up that is far more pressing…. then you realize IT’S not the pressing thing… this over HERE is the pressing thing… it then just continues in this vicious cycle. 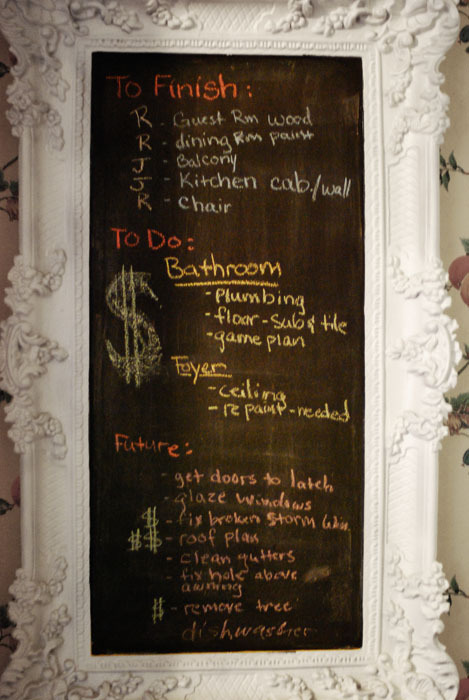 Well, we’ve been having those times and, both being list people, finally took to the chalk board and wrote out out to-do list. The $ signs signify when money will be needed and even in what quantities. What do you think? Is this going to take A. One year B. 2 years or C. Indefinitely…. Side note: The hubs whipped this lovely chalkboard up by purchasing a giant gold frame at a garage sale, painting the inside with chalkboard paint and spray painting the frame in white. :o) He’s crafty like that. That frame is great! What a clever idea! I am totally gonna “borrow” this idea! Do you care? SOOO CLEVER! Go right on ahead :o) It’s quite handy and oh-so easy.